The American Revolution was on in 1780, but that didn’t stop Harvard professor Samuel Williams from venturing behind British lines in Maine to observe a total eclipse of the sun. Though the British fort in Maine had recently been attacked unsuccessfully by a huge American fleet, the British commander gave Samuel Williams safe passage to watch the eclipse. They knew the data he gathered would benefit both sides, whoever won the war. 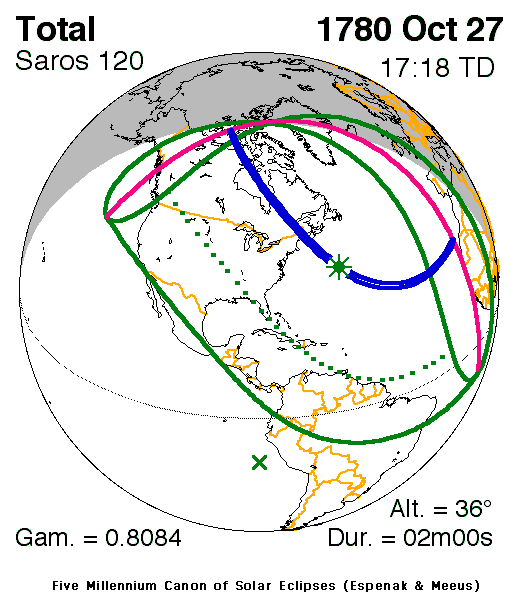 So on Oct. 21, 1780, the first American eclipse expedition watched the moon's shadow partially cross the sun from an island in Penobscot Bay. Then, to their dismay, the moon drew back before it totally eclipsed the sun. Modern historians blame Samuel Williams for an embarrassing failure, for they say he miscalculated the total eclipse by a few miles. Samuel Williams was born April 23, 1743, in Waltham, Mass., to the Rev. Warham Williams and his wife, Abigail Leonard. He graduated from Harvard in 1761, but missed his commencement exercises because he was on a scientific expedition to observe the transit of Venus in Newfoundland with John Winthrop, his teacher. Winthrop was one of the first to offer scientific explanations for natural phenomena. Earthquakes, for example, resulted from seismic activity rather than God's wrath, he said. Winthrop was great-grandson of the John Winthrop who founded Massachusetts Bay Colony. He was also grandson of Connecticut Gov. John Winthrop, who donated the first telescope to Harvard in 1672. After Samuel Williams graduated from Harvard, he taught for a few years, then got a job as a minister in Concord. From 1764-79 he served as a minister in Bradford, Mass. In 1780, Williams, along with John Adams and James Bowdoin, founded the American Academy of Arts and Sciences; Sam Adams and John Hancock were also involved. That same year Williams succeeded John Winthrop, as Hollis Professor of Mathematics and Natural Philosophy at Harvard, the designated spokesman for science in the Massachusetts colony. 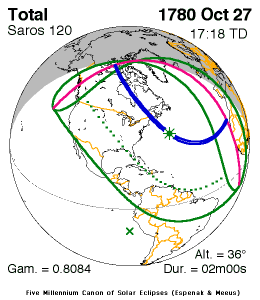 Williams knew that on Oct. 21, 1780, Europeans in America would have the opportunity to see a total solar eclipse, something they had never done successfully. A solar eclipse was a big thing. It would allow observers to measure longitude in America by computing the distance from Greenwich. The uncertainty of longitude in almost all locations in America ‘bedeviled the best geographers and mariners into the early 19th century,’ wrote Robert Rothschild in Two Brides For Apollo: The Life of Samuel Williams. Penobscot Bay. 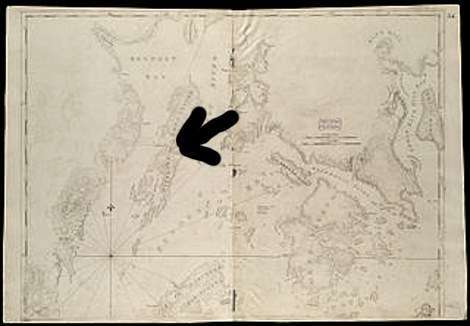 The arrow points to the observation site on Isleboro. There was a problem, though. The best place to watch the eclipse, according to Williams’ calculations, was near Penobscot Bay, controlled by the British. Penobscot Bay was a primary entry point for European shipping well into the 19th century. The British viewed it vital to the war. It was close to home port, gave them access to timber for masts and a strategic base to defend against privateers and to protect loyalists. The British constructed Fort George at the mouth of the Penosbscot River in Castine in 1779. When patriots in Massachusetts learned the British were building a fort on their territory (Maine was then part of Massachusetts), an expedition was launched to dislodge them. The Penobscot Expedition came to grief as the worst naval disaster in U.S. history. 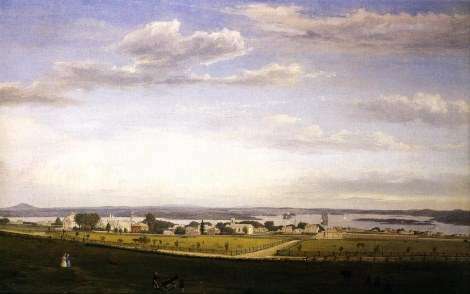 Shortly after the failure of the Penobscot Expedition, Massachusetts Speaker of the House John Hancock wrote a letter to the commander at Fort George asking for Samuel Williams' safe passage and permission to set up an observation site. Col. Campbell, the commanding officer, gave them five days and insisted they stay off the mainland. Those were hardly ideal conditions. Nonetheless, Williams and his small troupe – three assistants and six students -- packed their telescopes and set out for Maine in an old galley ship the Lincoln. They selected a site on the island of Isleboro, across from Castine. There they set up their equipment with the help of Capt. 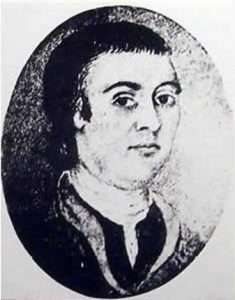 Henry Mowatt, who had burned Portland (then Falmouth) and repulsed American ships during the Penobscot Expedition. The group spent several days preparing for the observation. On Friday, they were delighted to see there wasn't a cloud in the sky. They had breakfast early. "All was hurry & agitation -- the eagerness of expectation gave a brisk flow to the spirits -- and gave life and vivacity for the business of the day," wrote one student. Just before 11 a.m. they adjusted their five telescopes and began to count the minutes and seconds for what they expected to be a total eclipse. During the one hour and 19 minute eclipse, the scientists recorded two-thirds as much dew was deposited as on the whole of the nights before and after. Just seconds after 12:30 p.m. on Oct. 27, 1780, Williams and his party realized they hadn't seen totality. They later realized the map of Isleboro was slightly off. If they'd looked east across Penobscot Bay, they would have seen darkness for five seconds on the mainland, about five miles away. A total eclipse would have allowed more precise measurements. As such, they needed several more days to adjust their clocks and make more calculations. But Col. Campbell had rushed them away. Only a few more days would have made the observations more meaningful. But Samuel Williams and his crew recorded sufficient data to accurately calculate their exact longitude and latitude. Without realizing it, Williams described Baily’s Beads, drops of sunlight that shine through the rugged lunar landscape as it passes the sun. A British astronomer, Francis Baily, later took credit for the observation. But Samuel Williams eclipse chasing was the first instance of state-supported scientific research in America. The expedition was supported by Harvard, the Academy of Arts and Sciences and the Commonwealth of Massachusetts. "It is remarkable to learn that even in the midst of the armed struggle, scientific advancement was considered by both sides important enough to take priority over the more ephemeral concerns of politics and military supremacy,” wrote Lars D.H. Hedbor in the Journal of the American Revolution. In 1787, Samuel Williams surveyed the boundary between Massachusetts and New York State. He resigned his post at Harvard in 1788 after he was accused of forgery and went to work at a church in Rutland, Vt. There he helped found the University of Vermont. He died in Rutland, Vt. on Jan. 2, 1817.